What’s so hard to understand about Random House’s strategy? Since Apple made its iPad announcement last January, five of the Big Six publishers have been featured participatants. That not only means they’re making content available for the iPad “form factor” (color and connectivity like the iPhone, screen size like the Kindle) but also that they’re buying into the new “agency model” for sales. As anybody who cares about this stuff already knows, under the agency model the control of pricing to the consumer moves from the retail point of contact to the publisher. In return for that control, the publisher lowers the “established retail price” and, although the stated margin to the retailer is reduced from 50% to 30%, the effective margin rises because the retailer sells at that publisher price, not something substantially less. And the publishers going to agency are happily accepting less for each book sold to gain that pricing control and price stability across all retailers. I wonder why they wonder. Although it is certainly possible that iPad book sales will be startling right out of the box, that’s not really likely. 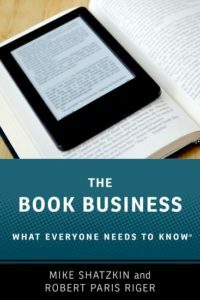 Unlike the Kindle, which is purchased by consumers solely for the purpose of reading books, the iPad will attract customers for all manner of reasons and, actually, reading books would be pretty far down the list for most people. Although there are pockets of skeptics, I’m sure most publishing people accept that the iPad can grow into a very robust bookselling channel but it isn’t clear how long that will take or whether narrative text will be as much a beneficiary of the device as books that are more complex presentations of words and pictures. In the short run, which from this seat looks like some months, if not a year, Kindle and Amazon are still likely to be the leader in ebook sales, and other established ereader platforms that are optimized for text (Nook, Sony Reader, the new ereader from Kobo) will remain important. By holding themselves out of the new channels, continuing the current policies of “wholesale” discounting, and allowing the retailers to set prices, Random House will be maximizing their short-term sales and profits. Assuming they maintain their publisher-established prices near their current levels (and why would they not? ), Random House will collect more money for each ebook sold than their competitors do while the public will will pay less for each Random House ebook they buy than for comparable titles from other publishers. That’s a pretty significant short term advantage. Why wonder why somebody would do that? And that may be Random House’s hunch too. They may be making a perfectly conscious and rational gamble that the sales they’ll lose in the short run by not being on the iPad will be more than compensated for by margin they’ll make through higher wholesale prices and greater sales through lower retail prices than any of their Big Six competition in the still-dominant Kindle channel. And if Amazon is willing to retaliate against a publisher’s print business over dislike of their ebook policies, wouldn’t they also be likely to favor the books of a big publisher that cooperates with them when everybody else doesn’t? Couldn’t that add a further incremental edge to Random House in the short run while the iPad book-reading audience is still ramping up? I have read nothing to tell me whether Apple would or wouldn’t accept Random House books on the wholesale model. (The other publishers embraced the agency model; they didn’t need to be talked into it.) If they do, Random House could persist with this strategy for a long time, even when they start putting books on the iPad. Even though their “listed” ebook prices would be considerably higher than their competitors’, the prices at which they’d be offered to the public could be lower. If this all works the way the agency publishers envision, we’ll have a multi-platform, multi-retailer, price-stable ebook market before too long. If that happens, Amazon may tire of paying more for Random House books, whether they sell them for less or not, and the wholesale model with retail price reductions is not a palatable combination for publishers. But that’s not imminent and for the foreseeable future, all the Random House position means to them is more revenue per copy and lower prices to the consumer. There is a school of thought that ebook consumers are very sensitive to price. Starting with the appearance of the agency model next week, ebook prices to the consumer for (usually author-) branded frontlist titles are going to rise. It will be interesting to see if the IDPF reports of sales show any change in the trend line starting with the reports of sales in April.